Thanksgiving is said to have gotten its start at a three day feast that some of the earliest settlers had along with their Native American neighbors. They had the feast in order to celebrate a successful harvest after a brutal winter the year before. This original dinner has expanded into one of the most important days of the year in terms of feasting and spending time with friends and family. 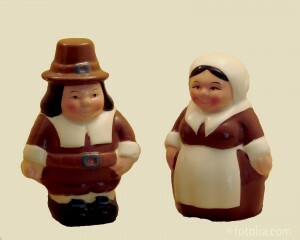 A lot of people often wonder what the Pilgrims and Native Americans ate at the first Thanksgiving. You might be surprised to learn what was and wasn’t available. Although there are few accounts that describe the menu detail by detail, there are a few letters with specific details, along with educated deductions based upon what was available at the time. Despite the fact that this is regarded as the first Thanksgiving, there are well documented traditions throughout history all around the world of people having celebratory feasts this time of year in honor of the harvest. There are records that go as far back as the Greeks and Egyptians. If you ever wanted to consider having a Renaissance-themed Thanksgiving dinner, then you should feel free. You can even have the hostess serve the dishes wearing a Renaissance wench outfit. Whatever way you celebrate Thanksgiving, or whatever you like to place on your table, please be sure to have an enjoyable holiday!